Handle design makes carrying tires easy and with little effort. Fit for most of tires 22" to 30" in diameter diameter,such as Cars,SUV,Off Road ,BMW,Benz,Audi and so on. 1.How to calculate:((For Example:195/55/R15Tyre Diameter Conversion Formula=19.5(cm)*0.55*2+15(in)*2.54=59.55cm).If you don't sure if it will fit your tire,plz feel free to contact us. Fit for most of tires 22" to 30" in diameter diameter,such as Cars,SUV,Off Road ,BMW,Benz,and so on. 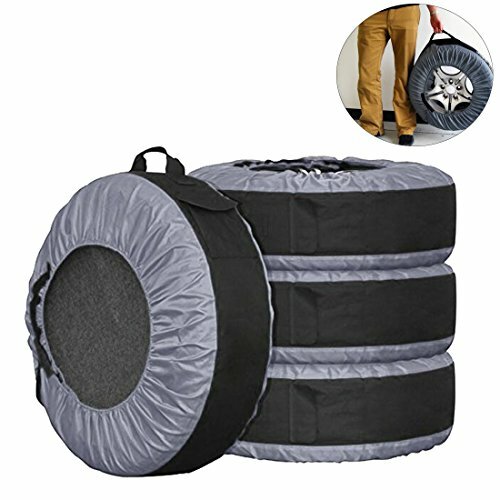 Protect your tires reduces the mess and hassle of seasonal tire change, handle makes it easy to lift and carry tires.Seasonal Tire Storage-Fit for winter or summer.Great for storing your wheels and tires. Made of 600Dpvc+210D ,durable and waterproof.Easy to use and with the high quality of the material.Handle design makes carrying tires easy and with little effort. How To Calculate Tire Size:(For Example:195/55/R15/85V Tyre Diameter Conversion Formula=19.5(cm)*0.55*2+15(in)*2.54=59.55cm). PACKAGE INCLUDES:4 Pcs Blue Tire Tote.Pls check your tire size before you purchase.Any questions,pls contact us. If you have any questions about this product by FLR, contact us by completing and submitting the form below. If you are looking for a specif part number, please include it with your message.